A bungalow in Gamuda’s Ambang Botanic project in Klang. DESPITE the move by Bank Negara last November to introduce a maximum loan-to-value (LTV) ratio of 70% for the third and subsequent house financing facilities to curb speculation on property prices, property consultants and analysts are convinced that there will only be a temporary setback for the property and banking industry. Hwang DBS Vickers Research, in its recent report, says the property market this year could still see 10%-15% growth, driven by scarcity of land and higher input costs. “While we believe the 70% LTV cap managed to control speculative activities to a certain extent, the strong underlying demand from first-second home owners and upgraders continued to support property sales, even at new benchmark prices,” it says. It adds that this can be seen with the recent launches that saw strong takeups such as Capers @ Sentul East condos where more than 90% of the units been booked at RM600 per sq ft and Sime's USJ Heights Indigo zero-lot bungalows with 75% sold at RM2mil to RM3.3mil per unit. “The others are Gamuda's Ambang Botanic, Klang where semi-D and bungalows are sold more than 90% at RM1.5mil to RM1.8mil per unit and Glomac Damansara serviced apartments (70% sold at RM600 per sq ft),” it says, adding that this supports its view that property demand should remain resilient, supported by positive macro factors (young population, robust economy, inflation hedging, urbanisation, shrinking household size, accommodative bank lending). The research house says another factor helping to boost property sales this year is the mass rapid transit (MRT) project. “While MRT completion may still be a while away, in 2016-2020, property prices (especially land) tend to move ahead as developers scramble for projects near potential stations (given the typical 5-year lead time to negotiate, plan, obtain approvals, sell and construct). Developers such as SP Setia have started pricing in potential of MRT interchanges in their launches (KL Eco-City commands ~30% premium),” it says. “While track record is important, we see owners of large land bank near potential MRT interchanges (or strong deal-makers) having an upper hand given scarcity of prime land in KL, and there should be no shortage of suitors to minimise execution risk. Strong overseas track record may give an added advantage in attracting foreign demand (e.g. YTL's Sentosa Cove, Guocoland group's following in Singapore and China). MRT and plot ratio expansion will strengthen the case to speed up development of raw landbank,” it says. A property consultant tells StarBizWeek that generally, there will be some impact on the mid-level to high-end property market due to the LTV. “Property developers may feel a slight impact on sales of mid-level to high-end property products as a result of the LTV. The impact can be expected as these markets (mid-level to high end property) are normally the playgrounds for investors and speculators. As LTV imposes those who are buying the third property, the Government is taking steps to curb the property price increase based on speculation. 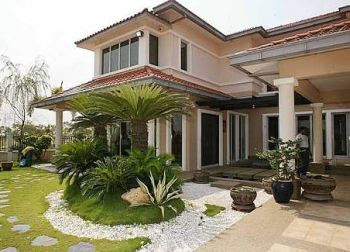 So, there will be less speculation in the property market,” he said. Bank Negara in its Financial Stability and Payment Systems Report 2010 says house prices in selected locations within and surrounding urban areas have shot up to four times that of the national house price index. It also says there have been incidents of applications for financing of multiple residential units within a single development project from a single borrower. “To address this, the LTV ratio is aimed at promoting a stable and sustainable property market by deterring speculative activity through higher equity requirements for transactions of this nature,” the report says. Maybank Investment Bank Research said in its recent report that housing loan applications had declined for the last three months on a month-on-month basis, partly due to recent measures to curb property lending. “Loans applications for residential purchases fell 3.8% month-on-month from December 2010 to January 2011, 7.1% from November 2010 to December 2010 and 9.6% from October 2010 to November 2010,” it said. However, analysts say they are optimistic the LTV will not hamper residential mortgage loans growth this year or even reduce residential property prices significantly. not be drastic, as up to 90% of banks' mortgage loans are held by homeowners, who are not speculative investors but have purchased residential properties to live in,” an analyst says. Another analyst says the decline in housing loan applications can be seasonal and can pick up as the year progresses. Going up, down or sideways? Mont’Kiara, predominantly an investor proposition, is facing a high rate of vacancy. Is there a softening in the condominium market? Some locations seem to be doing better than others while others are not doing as well as before. ABOUT two to three weeks ago, a developer promoted a friend-bring-friend sale, whereby if a friend were to buy a condominium unit, the introducer will get a small reward. That project, located in a desirable location, was launched last year, amid much fanfare. In another project, a developer is offering a 20% rebate. This enables buyers to pay 10%, enjoy a 20% discount off the purchase price and get a 70% loan. This 30:70 ratio satisfies Bank Negara's ruling (announced last November) which requires buyers of third and subsequent residential properties to fork out a 30% down payment. In another part of Kuala Lumpur, a developer launched a condominium and had 80% sales on the first day, prompting the company to open up its second block just a few days after the launch of the first block. At the same time, analysts are reporting that there will be a re-rating of property prices and that prices will go up. If their judgement call is correct, why are developers coming up with innovative schemes in order to sell their high-rise condominiums while other projects are selling like hot cakes? Chan says that ruling has been very well-implemented because most of her buyers now are those who buy in order to stay, and that 30% downpayment is not an issue with them. “Most of our buyers are serious buyers, they buy to occupy and when you buy to stay, that 30% down payment is not an issue. It is only when you are buying to invest, or to speculate that you think many times before forking out that 30% money up front,” Chan says. Much of SK Brothers' work involves helping developers to market their projects. Like S K Brothers, Reapfield is also seeking good sales from their negotiators. Senior vice-president Gerard Kho says the fact that the company increased its negotiators from 700 last year to 800 this year testifies that the market is good. Unlike S K Brothers who help developers to market their projects, Reapfield's sales are from the domestic, secondary market. “When Bank Negara announced that ruling, we were concerned but our agents told us not to worry, that developers and buyers will work around it and today, that is what we are seeing. Overall, the market is adjusting to it, and a rebate is one of the ways to do it,” he says. Nevertheless, there are certain things to note in the condominium market, excluding the KLCC market because that market is different, a real estate professional says. “Condominium prices are not the only things to watch out for, although that is one of them. The rate of rental and its rate of increase or decrease says a lot about a location,” he says. Mont'Kiara, predominantly an investor proposition, is facing a high rate of vacancy. “You can see that when you go by that area at night. Although the “how many units are lit up” principle may not be entirely accurate, it provides a good gauge of how popular a condominium project is. He says these are signs of a market going down. Right now, because it is location-specific, there is not much concern. The company he works for is nevertheless, keeping tabs on that market. Mont'Kiara, on average, is priced about about RM600 to RM650 per sq ft today, although some may be launched at about RM800 per sq ft. While Mont'Kiara offers mostly high-end condominium units, over at Damansara Perdana, the situation is slightly different. Prices are lower at Damansara Perdana and because of this, it enjoys a bigger market with both owner-occupiers and tenants. Because of its proximity to good amenities, it has a good rental market with a 430 sq ft studio unit at Ritz Perdana being rented out for RM1,200 to RM1,300. The older blocks in Perdana Exclusive (two rooms with 860 sq ft built-up area) are rented out for RM1,400 to RM1,500. “The studio is doing better in both the rental and in the for-sale market,” he says. In the event there is a softening, the condomininium market will be affected first, he says. Over at the KLCC market, there was much euphoria there and prices just escalated. Today, although prices have come down, that location seems to be holding well. “The KLCC condominium market offers a different product and it is a market that does not follow the trend,” says Reapfield's Kho. RAM Rating Services Bhd head of real estate and construction ratings Shahina Azura Halip says demand for residential properties will remain healthy. This is supported by domestic economic growth, healthy demographics with 40% of the population aged between 20 and 44 years and 37% below the age of 20, rural-urban migration (urbanites as a percentage of the total population in Malaysia increased from 68% in 2005 to 71% in 2009) and low unemployment rates (less than 4% between 2006 and 2010). “The high-end condominium market is envisaged to be more challenging given the substantial incoming supply. In Kuala Lumpur, where the bulk of such properties are located, the inventory of high-end condominiums summed up to almost 31,000 units as at the end of the third quarter of last year. This is projected to be joined by over 7,000 units in the next five quarters. This is expected to cap the potential upside for the prices of these high-end abodes. “The demand and supply dynamics vary according to location. The outlook on the broad sector may not necessarily translate into similar views on different locales. Areas such as Mont'Kiara and KL central business district are facing huge incoming supply, which probably explain the incentives that may be offered to push sales for certain developments. According to statistics from Ho Chin Soon, the incoming supplies in these two areas are expected to increase by a respective 24% and 25% between 2010 and 2012. “Prices of high-end units in these areas had fallen in 2009 and had only shown slight increase in the second half of last year. Dampened by the supply situation, rental rates for high-end condominiums in these areas have also been reportedly declining in the last few years. “We think they are unlikely to recover this year due to the large incoming supply. Rental rates for luxury condominiums in KLCC, for example, have fallen from about RM5 per sq ft in 2007 to around RM4 per sq ft in the third quarter of last year,” Shahina says. SHOULD there be any softening of the broad property market, one of the first segments that may soften will be the high-end segment of the condominium market. The landed housing segment is still seeing strong demand, particularly in the Klang Valley and Penang, says OCBC Bank (Malaysia) Bhd country chief risk officer Choo Yee Kwan. “For the residential segment, no clear signs of any softening have been observed. As the broad property market' would cover commercial properties, we have observed that the applications for the financing of commercial properties have held up in March 2011,” Choo says in an e-mail. He says the indication is that there will be an increase in housing loan applications in March this year, higher than the comparative volumes they saw during the preceding first two months of the year. It was reported earlier that housing loan application totalled RM12.56bil in January and RM10.26bil in February, which prompted questions whether the drop in application will lead to a slowdown in the property sector. Choo says the drop in housing applications from November to Febuary is not conclusive as the period was also subject to seasonal trends relating to the year-end holiday period and festive season during the beginning of the year. Typically, volumes tend to be lower during this period. “It is useful to note that there has, indeed, been no reduction in housing launches since the beginning of this year, and that the take-up rate has been good, particularly of landed properties in the more affordable price ranges. New launches for both landed property and condominiums (particularly those in the affordable price ranges) are still being well received. “However, for the high-end segment of the condominium market, there have been comparatively fewer launches which can also suggest that the demand for luxury high-rise units has somewhat waned. “The bottom-line is that we still need to observe developments over a longer period before making any conclusive assertions in respect of this matter,” he says. Choo says generally, the bank has observed that the loan quantum has been steadily increasing in line with upward price movements of residential properties, notably in the key areas of urban concentration such as the Klang Valley and Penang. One of the factors that can affect the selling prices of houses is the underlying cost of the core building materials like cement, steel and timber. KLANG Valley folks are known for their ability to cope with heavily congested roads but even they are growing edgy these days as many public facilities are increasingly becoming inadequate and overstretched. From the widely-publicised overcrowded buses, trains and other modes of public transport, parks, roads, public housing and recreational facilities are also over-stretched and need to be upgraded and expanded. It is important to ensure there are adequate space provided for more public facilities to promote a higher quality of life for the people. The level of livability of our towns and cities is to a large extent dependent on the overall environment and the adequacy and quality of public facilities provided for the people. In planning for the Greater Kuala Lumpur (GKL) conurbation, it is imperative for our planners to benchmark against other global cities around the world and learn from them why these cities have become such great metropolis. As the GKL covers quite a massive geographical area, together with the government land to be opened up for redevelopment, much can be done to improve things for Klang Valley folks. The master planning for GKL should strive for a sustainable global city that takes into account the fast expanding population. Development plans for housing, commercial facilities, schools, universities, hospitals and other infrastructure facilities should be able to cope with the expanding needs over at least the next 20 to 30 years. Meanwhile, there should not be too much emphasis on maximising land use and plot ratio in property projects as this will lead to over high density developments and over crowding. Instead there should be a healthy balance between the built and unbuilt environment, and it is important to allocate land for public parks and other wholesome recreational facilities. Although it is heartening to note that planning for a more efficient and better integrated public transport infrastructure for the GKL is underway, these facilities should be synchronised and be integrated with plans for other public facilities including new property developments. We can learn from Singapore how its mass rapid transit system (MRT) is planned holistically and meticulously to integrate with all the public housing apartments provided by the Housing Development Board (HDB). Every MRT station in the city state is within walking distance to the nearby HDB housing precincts and shopping complexes. Commuters can safely walk along paved pedestrian walkways to the stations. As the planning for the GKL's MRT infrastructure is still in the early days, the master planners should pay utmost importance to ensure the system can become a beacon for the greening of our cities. With proper planning, less people will need to drive around and there will be less road congestion and pollution. Many Malaysians believe that one of the main factors contributing to the severe overstretched public facilities can be traced to the influx of too many foreign unskilled people, especially those who are here illegally. Proper enforcement is necessary to ensure all the foreign workers in the country are here legally and are duly employed and properly supervised to prevent them from getting involved in undesirable activities. Besides stretching our public resources to the limit, there are also social problems that are associated with the big number of foreigners, especially illegal immigrants, in our midst. These include the increasing number of illegal foreign colonies or settlements, and other accompanying problems like outbreaks of diseases. It may be unfair to link crime to the immigrant population, but the fact is many people are uneasy when such settlements spring up near our housing estates. Often, for peace of mind, people have no choice but to resort to surveillance measures such as fencing up their housing estates and employing 24-hour security guards. The rising number of housing estates that are been fenced up and guarded this way, shows that this is a significant problem and more concrete actions need to be undertaken to return peace and security to our housing estates. Deputy news editor Angie Ng believes that in the pursuit of growth and development, the spirit and values of the individual should not be compromised.